Up till now we have understood the basics of Mint Language , Scope of Variables and Declaration of Subroutines/Functions. So we have got the complete basic idea about Mint Language. 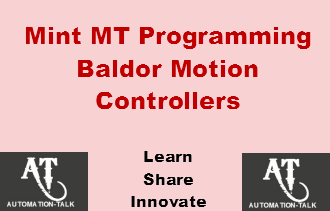 Now we will proceed with Program part i.e the basic program structure and how to make program in Mint Motion language for Baldor Products. MintMT always has a ‘Parent’ task (Main Program) used to Run / stop the child tasks , define child task priorities using TaskPriority , define number of instructions executed in a child task before switching using TaskQuantum , Check child task status using the TaskStatus keyword. The parent task also Contain global Event handlers such as ONERROR and also used for defining global data, functions and subroutines for use by other tasks subroutines and functions. Task is same as Program , task are the key builders in a Mint Program. Now let us see that how to declare the task to be used in Mint Program. Tasks are created with the Task keyword. The task defined in program are executed whenever the run command is issued for a particular task in the Mint Program. Task can be suspended anyway within the program using TaskSuspend. Tasks will run until End Task is executed. Hope that this tutorial helped you to understand about creation and usage of task in the Mint Motion language. Subscribe to Automation-Talk by Email.